When I bought the boat, it was clear that platform renovation would be more work than replacement. So I set about building new platforms. However, my experience was that the outboard cavitates and needs lowering a few inches. Once I looked into this I realised I could create a little more space and get the fuel can off the deck. This page provides the details I have from a few years back when I did the project. Please comment if you want more information. The platform with its box section acts as a beam. 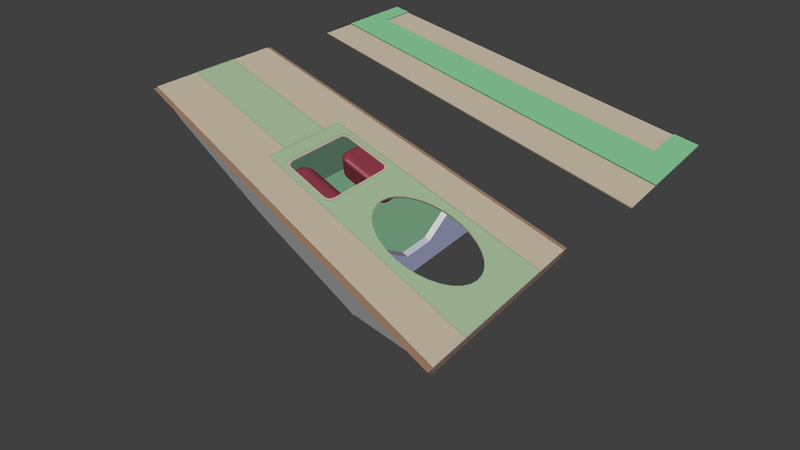 The top platform is in compression and therefore cutting out the hatch to allow the tank in will weaken this structure. Some additional reinforcing is required. I achieved this by increasing the area made from 2 layers of ply. The drawings below show the new design. 1. On top, the green shows the thicker ply lamination at 12 mm, the remainder is 6 mm. The transom cut away to lower the engine is not shown. You can see one tank which is a model of my 10 litre. Based on dimensions of an available plastic tank, the box should also take a 12 litre. 2. This view from below has the base hidden to show detail. 3. Same again here, but more straight on to show the struts that strengthen platform around the hatch. The additional weight is small as it comes only from the larger area of 12mm on the top, plus two more struts and a little more base size in the box. 4. Here's a final image with some extra detail. The CAD is a 3D modeller called Blender (it's free). It takes some effort to get going and it's not like ACAD, but I've used it successfully to design a new cut roof for chalet, so it work well!